Compliance with internal audits often escalates a project’s priority, forcing information security teams to put resource-intensive internal audit requests ahead of security-focused initiatives necessary to keep pace with the rapidly shifting threat landscape. Because of the critical nature of SAP systems and the business and financial processes they enable, its applications are the target of numerous industry standards and regulatory demands such as PCI, NIST, SoX and beyond. These applications are also increasingly the target of criminal threats from inside and outside an enterprise. In fact, in a recent Ponemon Institute survey, 65% of survey respondents disclosed that their SAP systems were breached at least once in the past 24 months. So how does today’s InfoSec teams balance these two competing priorities for their ERP systems – one a constant presence with clear consequences and the other a constant threat with often unknown, and possibly catastrophic, consequences – but both requiring constant vigilance? How to strike a balance between competing compliance and InfoSec priorities. About solutions that can assist with meeting compliance standards and anticipating internal and external threats. 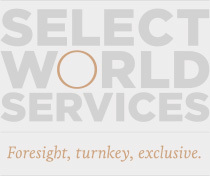 JOIN US for senior-level conversations, exchange of ideas and networking at Select World Services’ Exclusive, intimate, by invitation only CXO dinner – Aligning InfoSec and Audit to Automate SAP Cybersecurity.